Readers of this site and people who know me IRL will know that I’m currently going through a small ring phase. It’s not a ‘look at that rock from Tiffany’s’ type of thing, rather an abundant fondness for all sorts of finger adornments, the geekier the better. Since I’ve been splurging/investing on Etsy/eBay/Asos I thought it only fair to share with you some of my geeklicious finds and then my shopping will come unvder the heading of ‘work’. OK, research then-maybe? Here are five of my favourite geeky finger finds. Steampunk aficionados or any reader of China Mieville will adore this multi purpose ring. On first glance it appears a cool bronzed piece of finger candy, but once you’ve played with it it unfolds into a miniature telescope with two tiny lenses, which can also double as a magnifying glass. Oh, and there’s a compass as well- so it’s practical too! For ladies who love their tunes this sterling silver headphone ring is a great way to share the fact that you know all the obscure bands, and that you actually own a pair of real decks (OK, not necessary). I like the look of this ring- it looks surprisingly weighty and I think it’s sweet how the headphones encircle your finger. 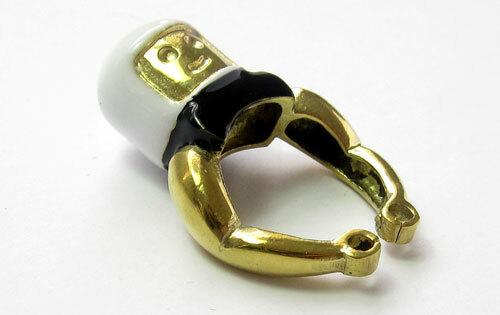 Proving that you’re never to old to play with toys, and that LEGO is not just for boys, this spaceman ring adds a bit of retro bling to your fingers. White and black enamel has been fused onto brass for a solid looking ring design that makes me happy inside. 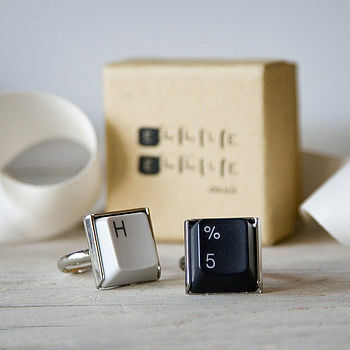 Less chic, more geek, these rings are created from old QWERTY keyboards. I like how they can be personalised by you choosing your name letter and they’re backed onto silver plate for a little extra class. 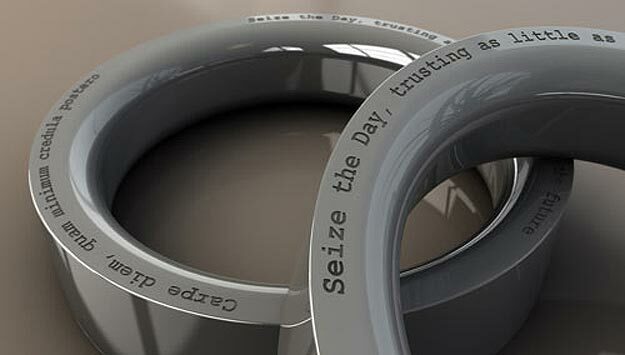 Less about the birdy, more about the words, this is a ring where you can get your favourite tweets inscribed upon it. It’s a cool way to share something particularly witty with the world, or even to gift to one that you care for. Check out Tweet Rings here. Do you have a favourite geek ring? I’m always on the hunt for more!